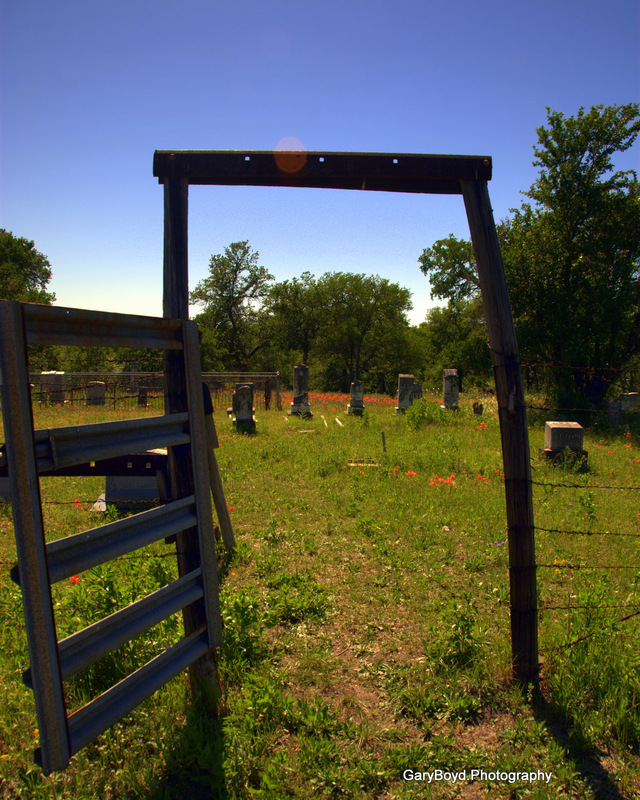 This past week my wife expressed a desire to visit the cemeteries where ancestors are resting up around Milam County in central Texas. Since the weekend was one of the few our daughter was off (thus no need for babysitter Paw-paw), I suggested we enjoy the the last of the wildflowers and a beautiful late spring/early summer day in the country. So Saturday morning I shut down the computer, loaded the car and we hit the road. It was a gorgeous Texas day of blue skies and greenery everywhere. 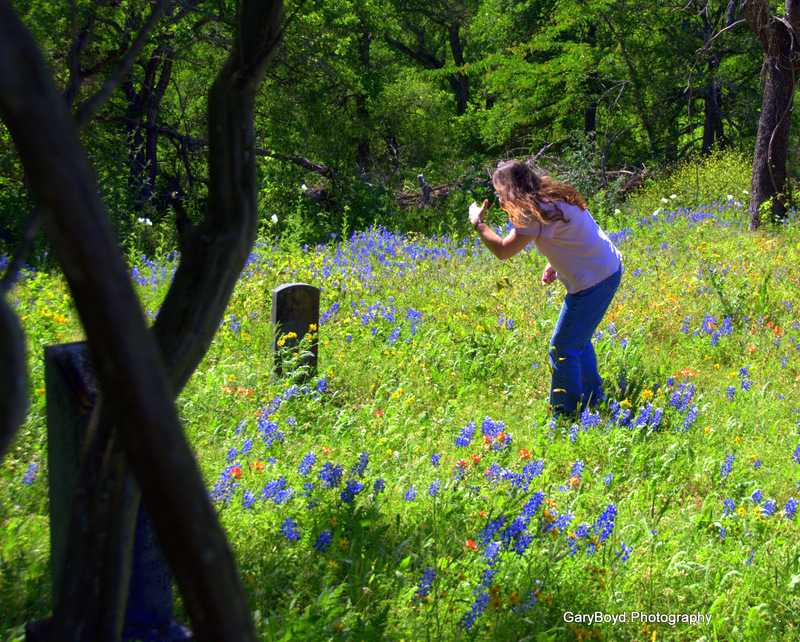 The bluebonnets of a few weeks ago in Austin County were mostly gone by now. The same could be said of Washington County. But the further north we went, the more flowers we were seeing in the fields and meadows. By the time we made Milam county we were back in the flowers of spring. One of the things that we both noticed was how green the entire area looked. All of our trips in the past have been later in the season and the predominate color we both remembered was the brown of seared grasses. This year, with the decade long drought having broken, the green of the grass was almost blinding in it’s brightness. Our first stop was to visit the little church cemetery where her father and his family are buried, Friendship Methodist Church Cemetery (FM 1915). FRIENDSHIP, TEXAS (Milam County). Friendship is on Farm Road 1915 eight miles east of Davilla in western Milam County. W. T. Walker established a Methodist church at Friendship in 1872. 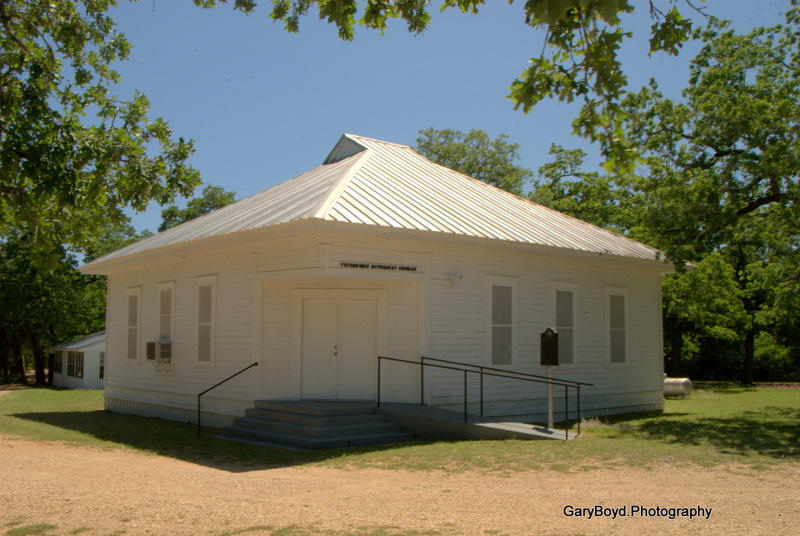 Its congregation met in a log schoolhouse until 1884, when a church building was constructed on land donated by Edward Wesley Graham. The Friendship schools were consolidated with the Sharp school district in 1948. In 1988 the church and cemetery marked the Friendship community on county highway maps. BIBLIOGRAPHY: Milam County Heritage Preservation Society, Matchless Milam: History of Milam County (Dallas: Taylor, 1984). Vivian Elizabeth Smyrl Handbook of Texas Online, s.v. “,” http://www.tshaonline.org/handbook/online/articles/FF/htf8.html (accessed April 27, 2010). After spending our time here, it was time to go exploring. Our first stop was to be Bryant Station Cemetery. BRYANT STATION, TEXAS. Bryant Station was on the Little River twelve miles west of the site of present Cameron in northwestern Milam County. It was established by Benjamin F. Bryant in 1840 as a fort to protect settlers from Indians. The village that grew up around the fort thrived because of its location on the Marlin-to-Austin stage line and gradually became a commercial center for the region. The post office at Bryant Station was established and discontinued several times between 1848 and 1876; it was known as the Blackland post office from 1874 to 1876. When the Gulf, Colorado and Santa Fe Railway was built through the area in 1881, it missed the community by three miles. Bryant Station faded, and Buckholts became the new social and commercial center. A historical marker was erected at the Bryant Station site in 1936. By the 1940s two cemeteries and a few scattered houses were all that marked the community on county highway maps. The Bryant Station school was consolidated with the Buckholts district in 1941. BIBLIOGRAPHY: Lelia M. Batte, History of Milam County, Texas (San Antonio: Naylor, 1956). Milam County Heritage Preservation Society, Matchless Milam: History of Milam County (Dallas: Taylor, 1984). Vivian Elizabeth Smyrl Handbook of Texas Online, s.v. “,” http://www.tshaonline.org/handbook/online/articles/BB/hvb98.html (accessed April 27, 2010). The last time we went hunting for this cemetery we couldn’t find it. So as we drove the gravel roads of the area I decided to do a very un-Gary thing and ask directions. We pulled up to a farm house well back off the road and questioned the young farm wife planting flowers in the yard as her farmer husband was riding a tractor in the field behind the house. She kindly directed us down the road to the gate where we found the small sigh marking the drive back to the cemetery. Along the way we bypassed the old suspension bridge across the Little River. The last time we were in the area, this was the bridge we used to cross the river… This time there is a new modern bridge to the upstream side of the old 1909 bridge. Though the very fact that they left the old bridge standing says something about the Counties historical mindset. Both ends of the bridge are now blocked to allow for pedestrians only. Even then it is hard to believe that it wasn’t that long ago that automobiles and trucks still used this as their means of crossing the river. To the best of our knowledge at the time, none of Sherry’s relatives are buried there. Though Bryant Station was settled and named for the brother of her Great-Great Grandmother. The Bryant Station Cemetery is located down a dirt track off a gravel road just north of the Little River (CR 106). Much of the cemetery is overgrown with tombstones poking above the greenery. When we parked in the tall grass we were greeted with this site… Here is another peaceful site. Butterflies, wildflowers, old roses and birdsong were all around you. The warmth of the day was moderated by the cool breeze blowing through the trees around the site. We spent most of an hour wandering through the flowers as we read the inscriptions on the stones that were still legible. It was a great way to spend a spring afternoon.